Search engines have historically indexed Web pages based upon text content. Now search engines are displaying other types of content integrated (blended) automatically onto the search results page. The intent of this blending is to satisfy the searcher and to engage them by making the results more relevant, essentially making the user happier with the search results. A blended search gives you results that the engine thinks would be useful to you, by including results from their search verticals, specialized engines that search only one type of content, like images, videos, news, local results, or blog posts. Blended results incorporate multiple vertical results with standard results. A blended search is the search engine’s way of trying to give you the most relevant results possible by giving you results drawn from multiple sources. 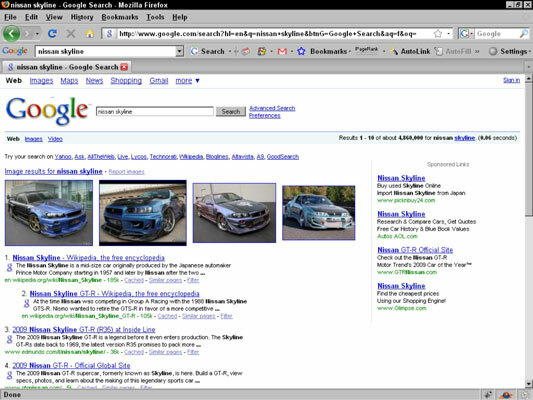 The images at the top of the above figure are brought in from Google Image Search as a result of blended search. It requires no effort on the part of the user to receive blended search results. Any query that the search engine algorithms consider to be a candidate for a blended result will have such results. Try this yourself with a query for a popular musician or movie and see what happens. Searching for a person or event that was recently in the news is another good way to see blended search in action. The results for the blended search include news items, images, and local results and many other types of engagement objects. These might be results that aren’t exactly what you are looking for, but Google thinks they might be useful, so they include them. Notice how the inclusion of an image seems to break up the page. This is important because it changes the eye-tracking patterns in the Golden Triangle.